5 Emergency Situations To Discuss With Your Small Children | Calgary Alarm Inc. Preparing your children for a possible emergency is very important. If they are aware of potential emergencies that could arise and have knowledge of what to do, it is much more likely that these children will respond quickly and effectively and be less prone to panic, which could make the emergency less distracted. In fact, this knowledge could be lifesaving in some instances. 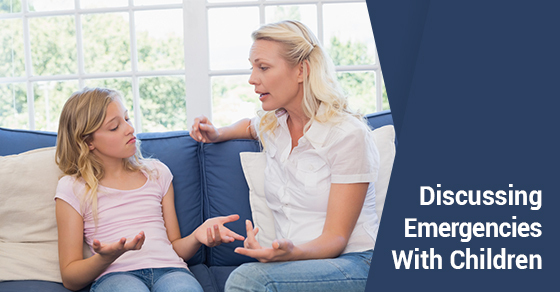 Here are BLANK emergency situations to discuss with your small children. When it comes to emergency situations, it is important to discuss all of the instances when your child should call 911. Role-playing can be very helpful to explain what exactly an emergency is, what 911 is and when to call them. Inform your children that if you see a fire, they should not go near it. However, for inside house fires, you should teach them to ‘stop, drop and roll’ if they are on fire and to get low to the ground and get out of the house as quickly as possible if they hear the smoke alarm go off. Practice a fire escape plan. This is one of the most difficult type of emergencies to discuss with children because sometimes it not always obvious when someone is injured enough that it warrants a call to 911. Perhaps their grandmother has fallen down the stairs and is unable to move. This would warrant a call to 911. If someone is unresponsive, this is a sure sign that 911 should be called. Look for a close home with adults in it – perhaps children are playing outside. Ask them to call the police. If your child comes home to see the door open, they should know not to go inside. Instead, they should go to their neighbour’s house and call 911. Children should be aware that if they happen to witness a car accident, or are in one themselves and the adult they are with is nonresponse, they need to call 911 immediately. It can also be helpful to discuss what an emergency is not – for example, a skinned knee or their pet running away. It is very important to explain that calling 911 when not necessary is very serious and that it could hurt someone who is in real danger. The award-winning Calgary Alarm is one of the best security alarm monitoring companies in Canada, offering a range of high-quality and affordable alarms. Contact us today for more.